Ohio Birds and Biodiversity: Evening Grosbeaks (sort of) invade! Lest you've been thinking about what to return as in your next iteration, avoid choosing a sunflower seed. One of the giant black-white-and-yellow seed destroyers that follow might get you. Your fate would be crushing: ground between the robust and powerful mandibles of our most powerful grosbeak, your tattered remnants to be unceremoniously expelled later from the bird's aft end. But if you're not going to be a morsel for one, an Evening Grosbeak is just about the coolest, baddest, most eye-catching songbird that can grace one's feeders. Some years ago, these showy grosbeaks of the North Woods made regular southward incursions into wintertime Ohio. Up until the early 1990's, fairly large-scale invasions could be expected every few years. And even in the off years, there would be a smattering of grosbeaks to be found. For newer Ohio birders, some of whom may not have even seen an Evening Grosbeak in the Ohio Territory, some of the counts of yore are nearly unimaginable. For instance, the Ohio Christmas Bird Counts (CBC) of 1969 collectively totaled 1,430 birds. Winter 1976 CBC's tallied 2,077. A jaw dropping 2,686 grosbeaks were counted in the winter of 1984. The average CBC total over the past decade is a paltry 16 birds. The decade prior to that saw average CBC totals of 122 birds each winter. Go back another decade and the CBC winter average over the ten year span was 653 birds. You get the point. There has been a precipitous downward slide in the number of Evening Grosbeaks invading Ohio. Thus, I was delighted to get two recent emails reporting grosbeaks, each with photos. Bob Rafferty reports five Evening Grosbeaks at his Knox County feeders on November 2, including this handsome male with a more somber female. Last Saturday, November 3, Rosalyn Rinehart glanced out the window of her Logan County home to see five of the showy big-billed gluttons making mincemeat of her feeder's stock. Strangely, few people object to the hefty seed bills that will be incurred should a flock of ravenous Evening Grosbeaks descend and settle in at the feeders. An Evening Grosbeak is the feathered version of Joey Chestnut, and can gobble down the sunflowers like no one's business. These weren't the only Evening Grosbeaks to be found. At least four or five other reports have come in from widely scattered locales. Keep an eye on those feeders. Thanks to Bob and Rosalyn for sharing their reports and photos with us. Have you researched the decline of the grosbeak? Growing up in northern New Hampshire, our back yard would be seasonally invaded by evening grosbeaks, 40-50 at a time, and occasionally a pair of rose breasteds would grace our crab apple. Would love to see a future update on the status of these birds in the northeast. 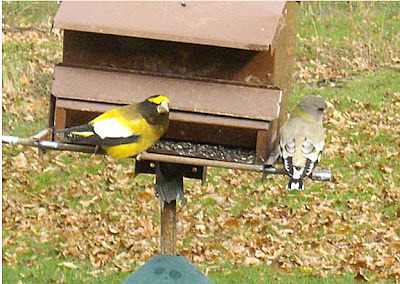 I read your article about Evening Grosbeaks this morning because a small flock of them (about 8-10) were at my feeder. I had never seen this bird where I live (Akron area). I'm sorry to hear they are on the decline. I really enjoyed their visit. I took a few photos but don't know how to post them.